Customizable storage cabinets designed especially for media and audio visual equipment storage. 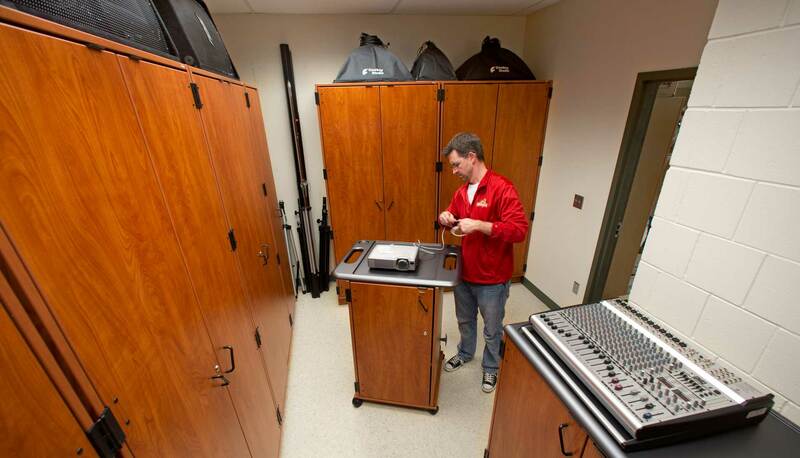 When you consider just how valuable all your facility’s media equipment is, it makes sense to store and secure it in a way that protects your investment. Being unable to find the proper cable, adapter or an expensive microphone when you need it is frustrating to say the least. Wenger’s fixed cabinets can help transform a chaotic storage area into one you can be proud of. Perfect for storage rooms or in-classroom lockable storage. Fixed media cabinets come in three types: Standard, Rackmount and Organizer. Choose the type you need then add shelves, drawers and other accessories (shown below) to fully customize your cabinet(s). Flexibility – Choose what you need: fixed or mobile storage, different sizes, mix and match interior with adjustable components, shelves, slide out shelves, file drawer, 4" drawer. Rackmount sections available for easy access to electronic components and organizer option available for fixed storage. At the time of purchase, you pick what you need. 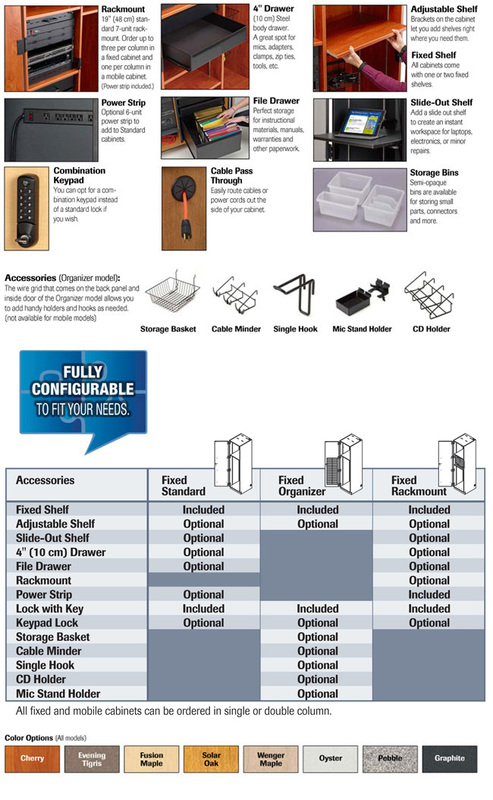 If your needs change, you can order different components to reconfigure your existing cabinets. Components are built to fit all the different types of cabinets, providing flexibility to move drawers or shelves from unit to unit. Security – Cabinets come with full-length wood doors, secured with metal lockable latch. Durability - Made to last with bolt through construction on hinges and doors, polyester laminate, tested to withstand institutional use. Mobile models come with a thermofoil wrapped top panel for scratch and stain resistance. Made for media use – Cable management and vented top panel for use of electronic equipment. Power strips and wire access. Rackmount option tips open to allow easy access. Adjustable and pull out shelves and drawers. Ease of Ordering – We provide online tools and phone consultation to help you decide what will work best for your needs and equipment. Please call your Wenger representative so that we can first thoroughly understand your needs in order to provide the best solution and an estimate to help you budget your investment.